Today is the first death anniversary of my father and I thought the best way to remember him would be to write about him. He was a wonderful father to me and my brother, and a great human being. He taught us many good things in life through his deeds and words. He was a great man who believed in simplicity and humility. Like every human being he too had to face many challenges in life. He lost his father in his childhood and had to shoulder the responsibility of the family very early in life. He worked hard like any family man to provide the best for us. I still remember the tough routine he used to follow as a conductor with KSRTC. He could study only up to high school level but he knew the importance of good education and therefore never compromised in providing us the best available, even if that meant sacrificing the comforts of life. He was a fighter and never gave up against any of the challenges which came his way. He proved it literally when he came back to life to live for another 10 years after a total pulmonary failure which forced him to be on ventilator for 23 days. He was a true optimist and always wished for the wellness of others. My father was a tough man with a kind heart. He was a man of principles. He considered everyone important and treated all with dignity. He never bowed in front of adversaries and would never surrender his self-esteem. He was always good to others even when it was not reciprocated. He was always there when his friends or relatives were in need. He valued the happiness of others more than his and always tried not to hurt anyone knowingly or unknowingly. He inculcated the helping mentality in us and taught us the importance of being social. 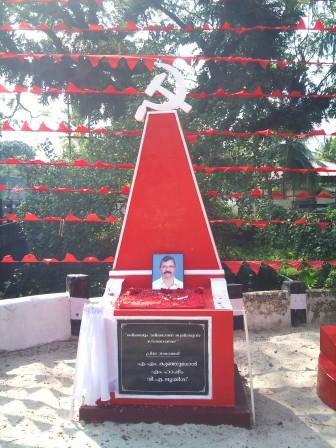 He was a disciplined member of CPM who restricted his activities to local level. He took pride in being a simple worker and never aspired for any position in the party even when it was offered to him on several occasions. He loved his party so much that he used to feel hurt when something bad was spoken about the party or its leaders. As a father he always trusted our abilities and let us choose what we want – be it in regarding our higher education, extracurricular activities or our career. I believe that this freedom and trust have played a major role in whatever success we have achieved in our life. I hope we would have made him proud when both of us got commissioned in to Indian Navy as officers. I have no doubt that he fulfilled all the responsibilities as a father but cannot say for sure that I did my best for him as a son. I am sure my brother would agree with me in saying that we are blessed to be the sons of a father like him. There are hundreds of incidents which are afresh in my mind to prove everything that has been mentioned here. I am sure there will be many more in the minds of all the people who knew him. His demise has changed my life forever. It has forced me to see life from a perspective based on the values and principles which I learned from him. I have not only lost a father but also a very good friend. I wish I could be as good a father to my son as my father was to me. I know that it is not so easy to be like him because he was really special and truly great. This entry was posted in All, Social by arshadtk. Bookmark the permalink.